Want a classic Boning Knife and a great S30V steel blade? 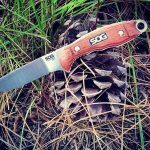 This is your knife then, SOG has made the Huntspoint Boning Fixed Blade Knife HT023L-CP just for you. USA MADE! The blade is a 3.6 inch satin polished steel. It is a flat ground blade that is perfect for skinning and boning with the strong S30V steel. The handle has Rosewood, a classic look for all times. This comes with a full grain leather sheath. Own a SOG Huntspoint S30V Boning Knife HT023L-CP? Tell us how you like it! Got a question? Ask! Somebody will answer!